The ultimate Valentine’s day sweets are chocolate covered strawberries. The ingredients are few and the equipment required is little but the romance quotient is very high. Melt the milk chocolate in the microwave by heating for 20 sec and stirring and repeating 2-3 times. 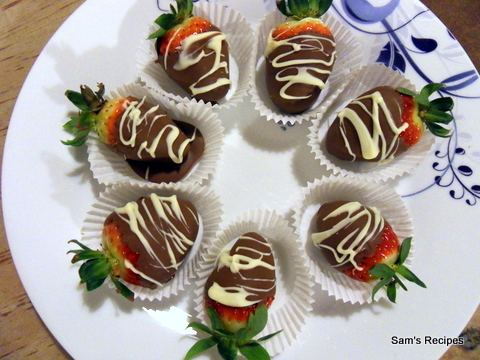 Dip the strawberries in the chocolate and lay down on a plate or parchment paper. Refrigerate till set, around 30-45 mins. Melt white chocolate in the microwave as for milk chocolate. Dip a fork or spoon in the white chocolate and swirl it on the strawberries. Freeze again till set. Tip: Chocolate nibs or bars can be used. If using bars, break it into small pieces before melting. Chocolate can also be melted in bain marie. If using microwave, be careful not to burn it. Even the most careful of chefs are susceptible. You can also decorate the strawberries with crushed roasted peanuts or coarsely ground pistachio nuts or leave them as is. Thaw the pastry dough as mentioned on the cover and roll it out to the required specification. Cut it into squares and then the squares into halves to get triangles. Place 1 tbsp chocolate spread and a few walnut pieces near the largest edge of the triangle. Roll from this largest edge till the very tip of the triangle. 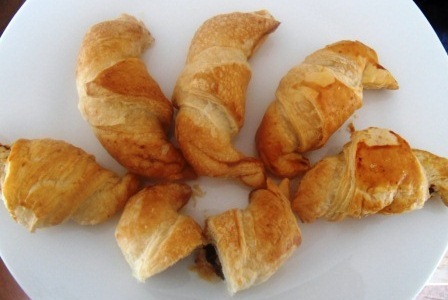 Press lightly all over the croissant to make sure all the edges are sealed so the chocolate does not seep out. Form a crescent and place on the cookie sheet/baking tray with the triangle tip facing downwards. This will prevent the croissant from unravelling while baking. Whisk an egg with 2 tsp milk and give an egg wash to the croissants to get a shiny surface. Bake for 35 mins at 165 C in a preheated oven. Leave to cool on a wire rack before storing in an air tight container.